President Akufo-Addo’s penchant for launching and commissioning projects his predecessor already inaugurated, is continuing more than two years into his administration. There are many examples of projects the President and his appointees, have wasted time and scarce resources to re-launch or re-inaugurate in their apparent quest to claim political credit with the latest being,the US$97 million e-justice project launched by the President on Wednesday. The e-Justice project, which was launched with support from the current Chief Justice, Sophia Akuffo on Wednesday, was inaugurated five years ago by the then Minister of Communications, Dr. Edward Kofi Omane Boamah, under the Inter-Ministerial Oversight and Technical Committees of the e-Transform Project,on Monday November 26, 2014. Dr. Omane Boamah, delivering a speech, said the $97 million e-Transform Project was a World Bank sponsored initiative aimed at supporting Ghana’s on-going effort to improve the efficiency and coverage of government service delivery using Information and Communication Technology (ICT). He said, the facility was secured to implement the e-Transform Project over a five year period to improve the efficiency and coverage of government service delivery using Information and Communication Technology (ICT) as a major driver of President Mahama’s socio-economic transformational agenda. Among the projects that were to be executed under the initiative, were: e-Health, e-Education, e-Justice including the Ministry of Justice and Attorney General Department, e-Immigration among others. 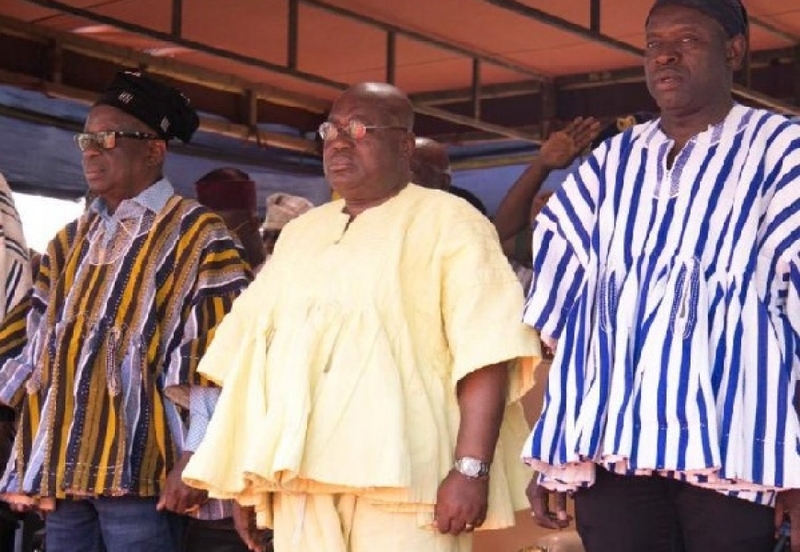 Not long ago, same President Akufo-Addo and Ministers of Communications and health, Ursula Owusu-Ekuful, and Kweku Agyeman Manu, District Chief Executives (DCEs) and many others, are on record to have inaugurated projects that were previously launched and commissioned by former President John Mahama and his government. Mrs. Ekuful is alleged to have commissioned an ICT project in the Eastern Region that was already commissioned by her Predecessor, so is MrAgyeman Manu, who inaugurated the already commissioned, Greater Accra Regional Hospital, formerly Ridge Hospital and replaced the plaque there with his. The facility secured to implement the e-Transform Project over a five year period to improve the efficiency and coverage of government service delivery using Information and Communication Technology (ICT) as a major driver of President Mahama’s socioeconomic transformational agenda. With the cooperation of the stakeholder Ministries, the Parliament of Ghana and the World Bank, the loan became effective in September 2014. It closing date was put at June 30, 2019. As part of the transformation process, the project was to focus on employing ICT-based interventions, relying on prudent and efficient use of resources to advance shared and accelerated development in priority areas of Ghana’s development. It was also expected to employ platforms to nurture new businesses, create job opportunities and promote entrepreneurship. The e-Transform project he said placed Ghana at a higher level of digital sophistication hence the need to integrate the Inter-ministerial Committee into the management of the project for strategic guidance and policy coherence. Dr .Omane Boamah, said the Inter-ministerial Committee also had the responsibility of ensuring that the Project Development Objectives, are achieved in good time, and it will take key decisions to guarantee smooth implementation of the project. Before the 2014 launch byDr. Omane Boamah, many media houses, including the state–owned Ghana News Agency (GNA) reported the medical practitioner in August 2013, as announcing that five million dollars, had been earmarked for the next phase of the e-justice system to enhance administration and delivery of justice in the country. Dr Omane Boamah, said this at the inauguration of a Huawei TP 3006 telepresence video conferencing equipment donated to the judiciary in Accra.The e-justice project seeks to infuse ICT products into the judiciary. The inauguration ceremony which was attended by the then Chief Justice (CJ), Georgina Theodora Wood, was with the collaboration of the Ghana Judicial Service and the Ministry of Communication, and would be funded with a $2 million facility provided by the World Bank. The project was expected to boost judicial transparency to facilitate access to a speedy, reliable and efficient justice system and enhance legal research and administration. It was also to complement the existing court automation programme to facilitate electronic filling and fast retrieval of documents, shorten processing of cases, offer concurrent access to files from different locations and better collaboration between the judiciary and stakeholders. Dr. Boamah expressed optimism that the provision of the facility would cut down on travels by staff of the judiciary from one geographic location to the other and carbon emissions by vehicular and air traffic. Mrs Justice Wood, said the equipment would provide judges with a virtual courtroom setting where evidence, judgments and other testimonies could be taken remotely from witnesses living abroad. She expressed the hope that it would improve case management and expedite justice delivery, especially at the Appeal division where additional courts had been set up in Kumasi, Cape Coast, Koforidua and Tamale. Mrs Justice Wood added that Rules of Court Committee would amend their rules in order that evidence and judgments could be taken and delivered electronically. On the benefit of the telepresence equipment, she said, it would reduce cost of transportation and risk of travelling among the staff of the judiciary. By April 2016, Dr Omane Boamah, said government had invested $5 million into the e-justice programme in a speech read on his behalf at the launch of National Communication’s Authority (NCA) 20th anniversary and unveiling of its anniversary logo. At last Wednesday’s function at the Law Courts Complex in Accra, Ms Sophia Akuffo, issued a stern warning to persons, who will attempt to railroad the newly launched Electronic Justice Project, a paperless court system rolled out by the Judicial Service. The project would be rolled out fully among the 44 courts housed at the Law Courts Complex in Accra. Ms Akuffo, stressed the need to apply process integrity and security to ensure the success of the project. Mrs Ekuful, Minister of Communications noted that the E-Justice project marked a milestone in justice delivery in the country. She noted that building courts with nice edifice was great, stressing without technology there will not be much change. Ms Cynthia Pamela A. Addo, Judicial Secretary, said the project would promote transparency and accountability in justice delivery.